Does Early Management of Whiplash-Associated Disorders Assist or Impede Recovery? What this abstract is telling us is that it’s probably best to wait a period of time before letting a physical therapist or a chiropractor begin exercise or manual therapy on one’s neck after a motor vehicle accident! Too much too soon is bad. Additionally, if you’re not getting better after at least four weeks of care, something needs to change. That means different care or another opinion. I’ve done enough independent medical exams over the years to tell you that both disciplines (chiros and PT’s) can get a bit too over zealous in their attempts to make you better with too much too soon. This review indicates not only does care too early delay your recovery it can lead to the development of chronic pain and iatrogenic disability! Iatrogenic means caused by the healthcare provider. Typically injuries are most painful for 3 to 10 days and will progressively lessen as inflammation reduces and repair begins. The PRICE Rule should be in effect at this time (Protect, Rest, Ice, Compress and elevate an extremity joint). Inflammatory cells and by-products, which are the source of chemically mediated pain, decrease significantly in numbers until the third week (Enwemeka 1989). Gradually, at the end of the acute inflammatory phase, functional range movements can begin. Treating too long typically isn’t helpful either! Treating over 8 to 12 weeks will not likely provide further remedial therapeutic benefit (won’t make you better). It may be palliative in nature (makes you feel good short term) but experts feel it leads to dependency on care. Kind of like the classical conditioning of Pavlov’s dog, I hurt a little, therefore I need care. The goals of care should be to abolish/reduce pain, improve physical and functional capacity (as clinically indicated) and wean from care. Most long term therapeutic needs can be achieved with well prescribed exercises you can do at home. If you have exacerbations, then you return to care, but not on a regular basis after the natural history of healing. Study Design. Narrative review of the literature and commentary. disorders can lead to iatrogenic disability. contributed to increasing its burden on disability. care too early after the injury is associated with delayed recovery. Clinicians need to be educated about the risk of iatrogenic disability. The above definition states that whiplash is the transfer of energy to the neck. What may be surprising is that this energy transfer is not equal. The force that an accident victim is exposed to is generally two and a half times greater than that which the vehicle is struck. A common misconception is that if there is no vehicle damage, there would be equally little or no injury. Manufacturers use of rigid or stiff motor vehicle bodies and chassis as well as improved bumper systems also produce an increased G force to occupants involved in car accidents. Minor vehicle damage may actually result in greater personal injury. We manage personal injury cases. 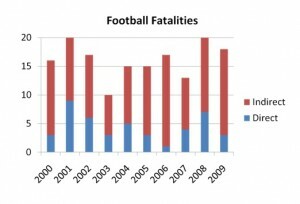 American football is among the most popular sports in the United States with the most potential for serious injury. Players at all ages and skill levels are at significant risk. There has been growing concern recently regarding the long term-risks of repetitive head injuries. 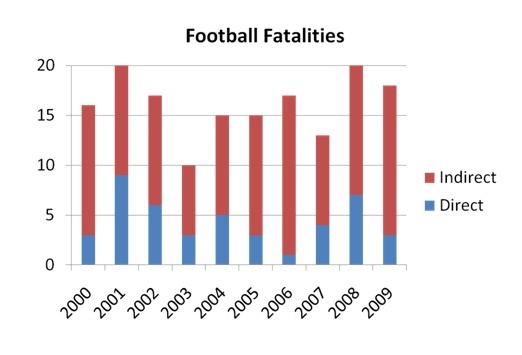 A small but stable number of direct and indirect deaths from football occur every year, and players are at risk for significant neurologic and musculoskeletal morbidity. The spectrum of injuries is diverse and is related to both the impact and the playing conditions. Clinicians must be vigilant about the diverse presentations of football injuries as the potential complications of returning to play before a player is safe can be devastating. The T1-weighted MRI shown demonstrates a facet dislocation of C7 on T1, a potential complication of axial loading while tackling. A concussion or mild traumatic brain injury is a transient alteration of mental status induced by traumatic biomechanical force, with or without a loss of consciousness. There are over 40,000 concussions suffered every year among high school players. Diagnosis is clinical as routine imaging studies of the brain are typically normal. A brain contusion is a more serious injury associated with localized structural damage and bleeding, often from multiple microhemorrhages, which is readily apparent on CT scans (arrows). They are most commonly found in the frontal and temporal lobes. In 1994, the National Football League (NFL) initiated a comprehensive clinical and biomechanical research study of mild traumatic brain injury, a study that is ongoing. In 2009, the NFL commission reported that memory-related diseases, like Alzheimer disease, occurred in former NFL players at 19 times the normal rate in men ages 30-49. There is a growing controversy about whether football players are adequately protected from the long-term complications that develop years after they retire. Pathology studies show diffuse brain parenchymal atrophy with advanced Alzheimer disease. Other studies have shown that players who suffered concussions were also more likely to suffer from depression. Cervical spine injuries are estimated to occur in 10%-15% of football players. A neck sprain commonly occurs as the result of a hyperextension or hyperflexion injury. 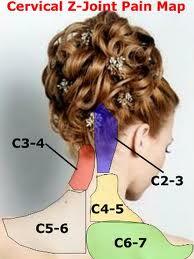 The result may be injury to cervical muscles, ligaments, intervertebral joints, cervical disks, and nerve roots. Pain may be present immediately after the injury or be delayed for several days. Other symptoms may include shoulder and back pain, numbness or tingling in the upper extremities, headache, and dizziness. Players should not tackle with their head down, as this increases the risk for spine injuries. Straightening of the normal lordotic curve of the cervical spine is commonly found after whiplash injuries, thought to be secondary to spasm or guarding (shown). Cervical subluxation, dislocation, or fracture occurs when significant axial loading forces are applied to the c-spine. Spearing is when a football player uses his helmet as the first point of contact with another player and is a significant cause of c-spine injuries and quadriplegia. Patients must be assessed anatomically, radiographically, neurologically, and physiologically. The most important initial consideration in a suspected c-spine injury is maintaining immobilization to avoid further injury regardless of current neurologic symptoms. Until stability can be established, all players must have their cervical spine immobilized. Plain x-rays are usually sufficient to diagnose injuries, like jumped facets of C4 on C5 in this x-ray, but in some cases CT, MRI, or both are needed. Chronic disk changes, such as disk space narrowing, occult fracture, or degenerative changes, are very common among football players. MRI imaging in these patients often reveals disk bulge without obvious herniation. Treatment for these players is conservative.